When: Friday-Sunday, 11 a.m.-9 p.m. When you walk into Mad Bomber Brewing, be prepared to share a stool, spiritually speaking. If you order a St. Nicholas Pale, you’re drinking with Staff Sgt. Nick Reid, who was killed by an improvised explosive device in Afghanistan last December. The Fatman India pale ale? That honors Staff Sgt. Kenneth Wade Bennett, who died a month earlier while attempting to defuse a device near Kandahar. He called his EOD (explosive ordnance disposal) team Fatman, after the bomb detonated over Nagasaki during World War II. And the Benjamin, a big imperial IPA, was the favorite of Sgt. Ben Sites, who succumbed to a brain tumor in July 2012. His parents plan to come out from West Virginia when that beer is tapped in a week or two. All were bomb squad buddies of Tom Applegate. The 26-year-old Montana native left the Army in June to launch his Hayden brewery, which opened Nov. 1. One of the first things you see when you enter the former Copa restaurant on Government Way is a metal detector that Afghani insurgents used to test whether their bombs could be discovered by U.S. troops. “I wiped all the Taliban off, so no one will get Taliban on their hands when they touch it,” Applegate assured. The walls are lined with photos of EOD technicians in action, dating back to World War II, including pictures of Reid and Bennett – and their funeral services. Along a bar toward the back is a series of tiles bearing the name of every U.S. bomb squad member killed in action, mirroring a memorial at Eglin Air Force Base in Florida. Of course, if you haven’t seen all this, “Mad Bomber” might suggest something more sinister, like the Boston Marathon bombings. One Facebook commenter called it the worst brewery name ever. Opening the brewery has been a challenge. The death of Reid, an original partner, almost scuttled the plan. So did the $26,000 bill for a walk-in cooler and draft system, one of the few pieces of equipment Applegate couldn’t build himself; only a last-minute push on Kickstarter salvaged the project. A batch of bad yeast forced the dumping of 200 gallons of beer on opening weekend, a blow considering that the brewhouse can only produce 40 gallons at a time. Applegate didn’t plan on becoming a professional brewer when he picked up a Mr. Beer kit some five years ago. “It was so bad, I was never going to do that again,” he said. 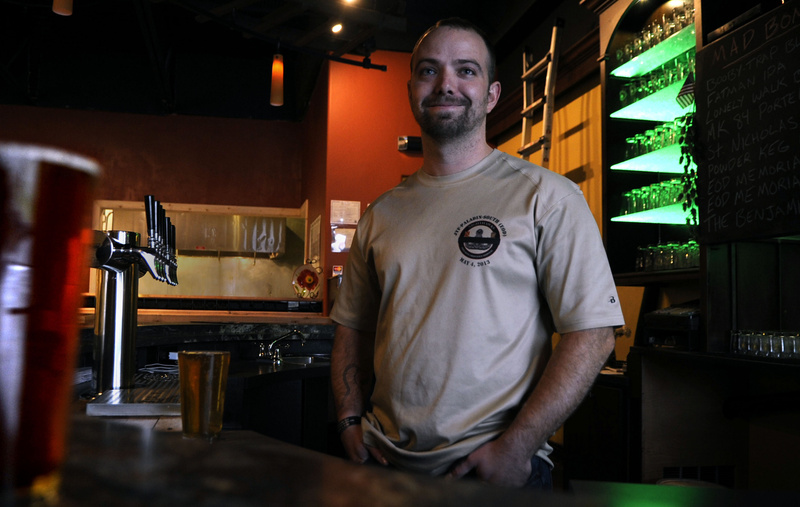 Then his parents took up homebrewing on a more serious scale, and when Applegate returned from a tour of duty in Afghanistan in March 2011, he used his combat pay to buy a brewing system. Stationed in Yakima, he tested recipe after recipe out of his garage with his Army pals. Mad Bomber’s six initial offerings all are quite clean and relatively dry. The lighter-bodied St. Nicholas (5.6 percent alcohol by volume, 41 International Bitterness Units) has a bright hoppiness thanks to a dose of Citra. The well-balanced Fatman (7.0, 75) uses all Cascade hops, showing off their earthy, spicy side along with the familiar grapefruit flavor. An entry-level Booby-Trap Blonde (5.9, 24), substantial for the style, gets a floral aroma and slight fruitiness from Liberty hops. On the maltier side, there’s an MK 84 porter (5.8, 31), named after a 2,000-pound bomb, with the signature coffee and chocolate notes, and – in a growing North Idaho brewery tradition – a brown ale, dubbed Lonely Walk (6.6, 36). The most distinctive offering is the Powder Keg (7.0, 85), which Applegate calls an India brown ale. Its dark, caramel-citrus sweetness is followed by a long, bitter finish from piney Chinook and Simcoe hops. Along with the brews, an array of appetizers, salads and sandwiches is available for delivery from the neighboring EnVision Café. • Coeur d’Alene could have another brewery by next summer. Paragon Brewing, a project involving local firefighters, will take over the Sully’s Pub & Grill, 5785 N. Government Way, in April and build a seven-barrel brewhouse next door. Plans call for regional distribution as well as serving the restaurant. • A second brewery is on the way at Green Bluff, joining Big Barn. The owners of Legacy Farm hope to have The 238 Brewing Company (a reference to the area’s phone prefix) up and running next summer, serving a handful of beers at the tasting room. • Also shooting for a summer opening is Cloudburst Brewing, the still-developing project of a pair of Spokane Valley homebrewers. • On the flip side, BiPlane Brewing in Post Falls has closed after two years of operation. The business struggled after the married couple who owned it separated. • Selkirk Abbey is pouring its biggest beer yet. The 12°, a Belgian strong dark ale (12.2 percent ABV), is rich, sweet and deeply fruity with a warming potency. The Post Falls brewery also took delivery of a new 15-barrel brewhouse this week. The former seven-barrel system has gone to Waddell’s, which plans a soft opening for its north Spokane brewpub at month’s end. • Spokane’s Iron Goat will soon receive new tanks that will more than double its capacity, enabling expansion into the North Idaho market. The seasonal Goatnik Russian imperial stout should be released this week, followed in early December by the Cap’n Kidd Scotch ale. • An espresso pomegranate porter aged in Syrah wine barrels is the newest offering from Twelve String, with the seasonal 12 Strings of Winter expected next week. The Spokane Valley brewery is adding six taps, which will allow for four or five barrel-aged beers to be available at a time. • Elsewhere in the Valley, Hopped Up is welcoming winter with Destroy My Sweater (8.5, 50), a complex brown ale brewed with spruce tips. • It’s not a new beer, but No-Li is rebranding its flagship Crystal Bitter as Spin Cycle Red. Originally named back in the Northern Lights days for its use of crystal malt, the beer already had been recast by No-Li as a tribute to the Crystal Laundry that was torn down for Expo ’74, with washing machines added to the label. • The new Total Wine & More opening Thursday at 13802 E. Indiana Ave. promises bigger and better things for beer lovers. Not only will the bottled selection be more extensive than at the North Division store, the growler station will use a counter-pressure filling system, which keeps beer fresher before it’s opened – up to months at a time. • Spokane now has a chapter of Girls’ Pint Out, a national organization for women interested in craft beer, joining the recently established North Idaho chapter. The initial event was last week at Saranac Public House; for future activities, keep an eye on girlsbeerblog.com or Washington Girls’ Pint Out on Facebook. This month’s Idaho gathering starts Friday at 6 p.m. at Mulligan’s Bar & Grille, 506 W. Appleway Ave. in Coeur d’Alene.